There are a few different studies on banking apps out there. While some of the numbers may vary, most of them point to these key attributes for app success: ease of navigation, app appearance, suitable range of services and quick access to relevant information. Customization of features and the use of biometrics to secure personal information are also important elements. Community banks may want to consider these attributes when developing or updating your apps. Interestingly, a recent report by Malauzai Software finds new app growth rate among banks and credit unions has slowed to 8% this year. It suggests most institutions have already jumped on the mobile banking bandwagon. Malauzai analyzed data from 7,686 banks and credit unions with assets ranging from $50mm to $5B. The findings suggest that by now most banks and credit unions have mobile capabilities. Those who do not at this point generally have less than $100mm in assets. Because the mobile banking app market is nearly saturated, the mere fact that you have one is no longer enough. Instead, banks need to find ways to make their mobile offerings stand out. This is especially important since the channel has so many users. About 62% of respondents to a recent Bank of America survey say they now use a mobile banking app, up from 54% in 2016 and 48% in 2015. Notably, 83% of users say they access their app at least 1x/week, with 29% checking at least 1x/day. There are several ways to help differentiate your mobile app from the pack with user-friendly features that have not yet become the industry standard. For instance, a feature Bank of America recently added allows customers to start an ATM withdrawal process on a mobile app. When customers arrive at the ATM, they can either use their smartphone or debit card, enter their PIN, and a personalized screen will display asking the customer if they are here to complete the withdrawal. This eliminates four steps at the ATM and is meant to save time for customers. Other banks are starting to build spending controls into their apps. Some banking apps, for instance, offer an option that allows users to turn a debit card on and off when a card is misplaced or stolen. Ally Bank recently launched upgrades to its mobile app that allows customers to set weekly or monthly spend thresholds for transaction amounts. The app also has a setting that allows cardholders to keep their debit card active around their phone, or only within a specified region on a map. Here's another creative idea. Fifth Third recently rolled out an app that helps customers save pocket change in order to make extra payments for student loan debt. 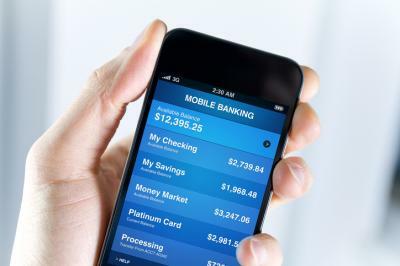 While this app is separate from their mobile banking app, some banks might want to consider adding similar features to existing mobile banking apps. You might also consider building in features that provide users with more money management capabilities, which could also be popular with customers. One feature of Bank of America's updated app allows customers to create personalized savings goals with names, pictures and target amounts. This lets users track their progress and prioritize funds accordingly. The bar has definitely been raised in the mobile banking arena so community banks will need to adjust perhaps. Look to stay informed and keep following technology to support your customers in the best way possible. Perhaps doing so will even help move the needle on the percentage of customers using mobile apps as the whole world gets more and more tech driven. Yields skipped down 3bp as investors pondered the potential Fed Chair candidates and the recent stock market dip. 1) JPMorgan has acquired digital payments company WePay Inc. The bank plans to use the acquired technology to better serve its 4mm small business clients as it expands capabilities in this area. Stay close to your business customers as these types of deals are likely to continue. PayPal is gradually introducing Venmo payments at US retailers hoping the convenience will increase sales. Users can pay select retailers with their Venmo balance or linked cards. Venmo processed $8B in payments in Q2 17. San Francisco Fed President Williams said the economy is more robust than is perceived, so the Fed has room to raise rates in Dec and 3 more times in 2018. There are now 86mm mobile banking consumers in the US. A TD survey of small businesses with <$1mm in annual revenue finds 72% that expect to seek a loan or line of credit say they will do so with their primary bank. Professional IT organization Isaca reports 61% of board members and senior executives surveyed said there is greater risk from cyber threats. That said, only 55% said their company is "doing everything it can" to secure systems and protect data. Juniper Research finds the number of ride-sharing service drivers is expected to increase almost 15% by 2022 globally. This growth will impact the auto industry and financial institutions with an emphasis on auto lending. Moody's analytics finds only 16 states are ready to provide additional services needed for even a modest economic slump, and 15 states would have difficulty if they saw a tax revenue decline and increased demand for services. Those states that are the least prepared: LA, ND, OK, NM, IL, CO, NJ, PA, MO and KS. Did you know October is Cyber Security Month? It is a good time to ensure your bank has robust cyber security systems to protect both your bank and its customers. For more information, check our BID from October 5th.